Chassis 54210 was the final Type 54 built and used for the factory team by Albert Divo and Achille Varzi. 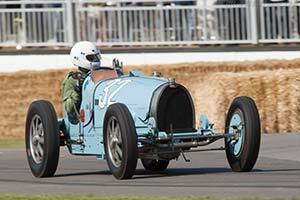 It was the later, who scored the car's greatest success when he won the Avusrennen in 1933. The factory eventually sold the car to legendary collector Dr. Samuel Scherr, who allowed Bill Milliken to race the car in the early 1950s. Following a succession of American(-based) owners, it eventually returned to Europe in 2008. The rare Type 54 has since been restored to its Avus-winning configuration and raced at the 2009 Goodwood Revival and demonstrated at the 2011 Goodwood Festival of Speed.